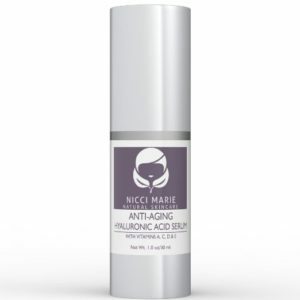 What does the Nicci Marie Skincare Anti-Aging Hyaluronic Acid Serum do? The Nicci Marie Anti-Aging Hyaluronic Acid plumps your skin to reduce the signs of aging, such as fine lines and wrinkles, smooths your complexion and super hydrates your skin. Your skin is more youthful, clear and radiant. The powerful antioxidants help to reverse the damage from free radicals, promote the growth of collagen and protect your skin from further moisture loss. 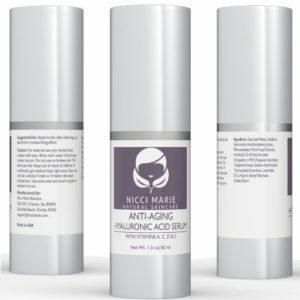 Who should use Nicci Marie Anti-Aging Hyaluronic Acid Serum? This serum is great for people who want to reduce the signs of aging in their skin and give their complexion a more youthful and radiant glow. With all of the antioxidants in this serum, people with tired, dull skin or free radical damage from environmental pollution, age spots or sun spots will really benefit from using this serum. 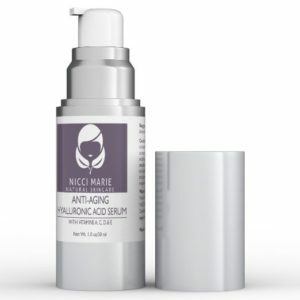 How do you use the Nicci Marie Anti-Aging Hyaluronic Acid Serum? There is actually quite a bit of good information on their website about how to use the Nicci Marie hyaluronic acid serum. This is because some people with very dry skin complain that hyaluronic serums in general tend to make their skin even drier, rather than acting like a super hydrator. For dry skin – cleanse your skin, apply the serum to your damp skin then seal in the serum with your moisturizer. For oily skin – you may well be able to forgo the moisturizer after applying the serum (as for dry skin), because sometimes people with oily skin find that adding a moisturizer is just too much. For combination skin – Try adding the moisturizer and if that is too much, just use the serum as for oily skin. Also, if you live in a very dry climate and have dry skin, you most probably need to use a moisturizer to seal in the serum. People in humid climates, even with dry skin, may or may not require a moisturizer. 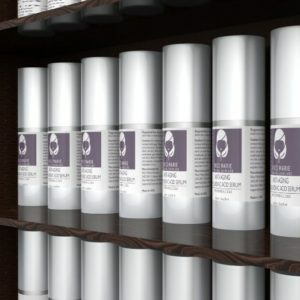 The Nicci Marie Anti-Aging serum has hyaluronic acid, vitamin C, A, D and E, also Witch Hazel, L-Arginine and Lavender Oil. Hyaluronic acid has the capacity to absorb more than 1000 times its own weight in water and is known as a super hydrator. Serums with hyaluronic acid really boost your skins capacity to absorb and to retain moisture. The result is a more plumped-up feel and look to the skin, which helps to reduce fine lines and wrinkles and makes your skin look fresher and younger. Vitamin C is a super antioxidant that is essential in wound healing and helps to reduce the signs of aging, due to free radical damage. Serums with vitamin C are extremely popular because they reverse skin damage caused by the sun, strengthen the skins barrier to further damage, reduce inflammation, reduces pigmentation and sunspots and promotes the production of collagen. Vitamin A helps to reduce fine lines and wrinkles and promotes the production of collagen in the skin. It is also very effective in treating acne, exfoliating the dead and dry cells in the skin, helps to heal wounds and repairs the cells in our skin. Vitamin A also reduces pigmentation and brown aging spots in the skin, increases elasticity, decreases the production of sebum and improves the moisture content in our skin. We produce vitamin D in our body in the presence of sunlight, but how much we produce depends on how long we stay in the sun. Too much and our skin becomes sun burnt, dry and attacked by free radicals. So adding vitamin D to skin care products helps to repair our skin and promote the production of new skin cells. It also stimulates the production of collagen, reduces fine lines and wrinkles and minimizes dark aging spots. Vitamin E has long been used in skincare products due to its ability to heal wounds and moisturizes our skin. It is also a powerful antioxidant which fights the signs of aging in our skin. During the manufacturing process, none of the ingredients or the serum itself are tested on animals. Nicci Marie use high quality assurance practices as well as CFTA quality controls. PROS: Of the customer reviews, 80% have given this hyaluronic acid with vitamin C serum a 4 or a 5 star rating. Many of the comments said that they were very happy using this serum, that friends had noted how much younger they looked, that it reduces fine lines and wrinkles and works quickly. One reviewer said that this serum helped to reverse the signs of sun damage where other serums had not, and that it sat very well under makeup. CONS: Less than 10% of customer reviews were one star, the vast majority said that they had not found any difference in their skin since using this serum. Others remarked that it had dried their skin, was too sticky, the pump didn’t work and one person came out in hives. 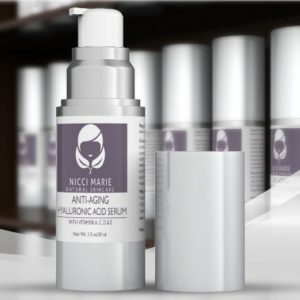 You can read more customer reviews here: Nicci Marie Skincare Anti-Aging Hyaluronic Acid Serum – Customer Reviews. Does the Nicci Marie Skincare Anti-Aging Hyaluronic Acid Serum work? The Nicci Marie Hyaluronic Acid serum has a lot of happy customers and so this hyaluronic acid and vitamin C serum appears to work very well in reversing the signs of aging and rehydrating your skin. An added plus is that you can see how much of the serum is remaining through the frosted glass bottle. Nicci Marie offer a 30 day money back guarantee on this product. Where can you buy hyaluronic acid serum? check out today’s discount price here.